It is believed that during the year 534 AD Amreli existed was formerly known as Anumanji, Amlik and then Amravati. The city is named in ancient Gujrati as Amarvalli. It is learnt from the prescription that Nagnath temple that ancient name of Amreli city was Amarpalli. Initially Amreli was the part of the former Gaekwad of Baroda. Very little information on historical background is available for Amreli District prior to becoming part of erstwhile Baroda State. Amreli district was named after Amreli city. It is a headquarters of the district. When Damajirao Gaekwad, the Maratha general, came to Kathiawad in about 1730, three parties viz Kathis of Dubalia carter, some Saiyads holding sanads of lands obtained for the king of Delhi, and Fozdar of Junagadh, subordinate to suba of Ahmedabad, held sway. Damajirao and the Maratha forces defeated all three and levied tribute on all of them. Later Damajirao Gaekwad, established military camps at Amreli and Lati in 1742-43 A.D. In 1800, the then Gaekwads appointed Vithalrao Devaji (Dighe/Kathewad Diwanji) as subehdar of the Gaekwads Kathiawad possessions. Vithalrao Devaji settled in Amreli and developed the city and its surrounding regions over the next 20 years. It was during this period that Amreli became a small city. During the Gaekwad regime in 1886, compulsory and free education policy was adopted in Amreli for the first time. After Indian independence in 1947, the district became the part of Bombay State and then a separate district in Gujarat State after the division of Bombay State in 1956 into Gujarat and Maharashtra. Most part of the commercial area is called Tower Road stretching from Tower to the Main Bus stand and further to Gopi Cinema. Amreli is a small city in Kathiawar in Gujarat. 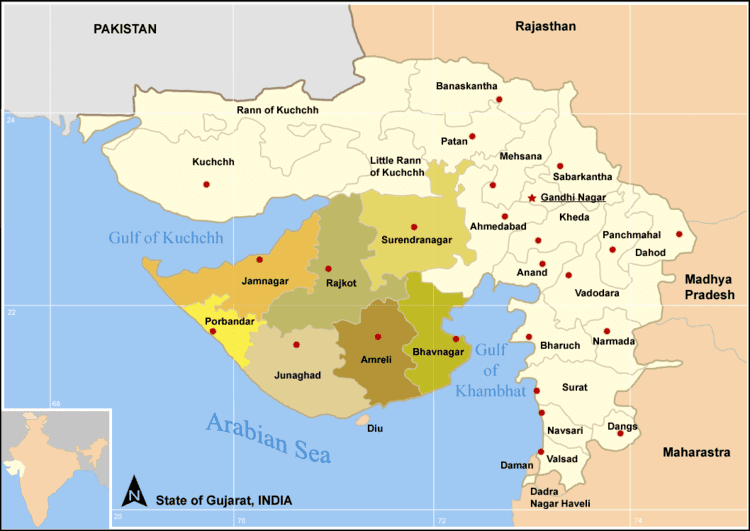 The Kathiawar, peninsula of western India, is in Gujarat State. The peninsula extends southwest into the Arabian Sea and is bounded on the northwest by the Gulf of Kachchh and on the southeast by the Gulf of Khambhat. Area, about 60,000 km² (about 23,000 sq mi). Amreli has variety of lands like Medium black, loamy, sandy, rocky inferior and saline mainly groundnut, cotton, sesame, bajri, wheet and grams are grown therein. And it has 2 coastal Areas Jafrabad and Rajula. The peninsula of Kathiawar is named after the Kathis who came to Saurashtra at the close of the fourteenth century. Their origin is not fully known but it is possible that they were driven southwards by the Muslim invaders. Khachar and Chotila were the most important seats of the Kathis. Worshippers of the Sun, they were essentially nomadic and had developed, among other pastoral occupations, the art of horse-breeding. Successive waves of immigrants from other parts of India have led to a superimposition of different communities and cultures in Kathiawar. The powerful royal families, which conquered Saurashtra later on established their rule over there. 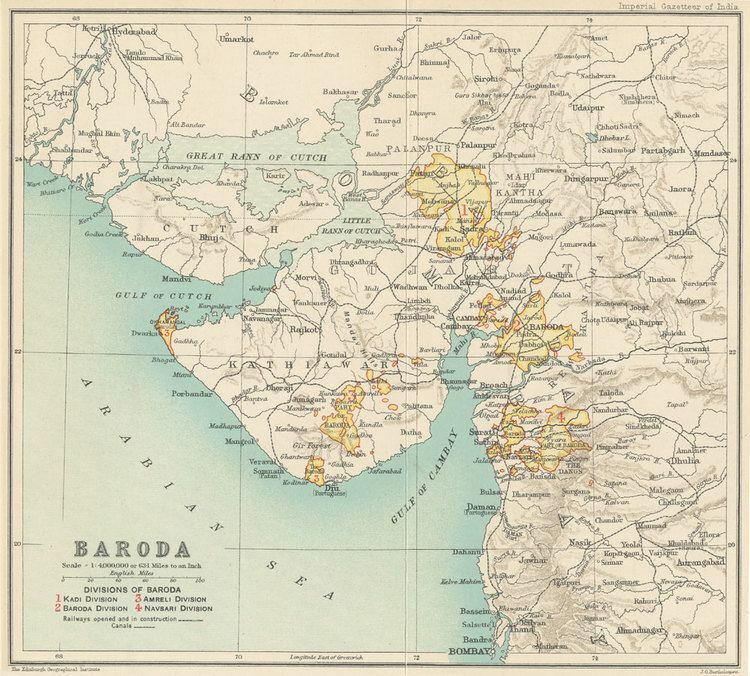 Baroda was a former Indian state in western India, 8,176 square miles (21,180 km2); it had four divisions, three in Gujarat (Kadim, Baroda, and Navsari) and one in the Peninsula of Kathiawar (Amreli, with Okhamandal). Once a part of the Mughal Empire; in the 18th century its princes belonged to Maratha Confederacy; c. 1721 it secured part of Gujarat; in 19th century subject to British administrative control until 1881; became part of Bombay state 1948 and of Gujarat state 1960. Before 1948, there were some 260 Princely states in the Kathiawar Peninsula of western India. These were consolidated in a single state named Saurashtra, in which the former rulers would alternate as the constitutional head. Eventually, as expected, Saurashtra became a part of the state of Gujarat.